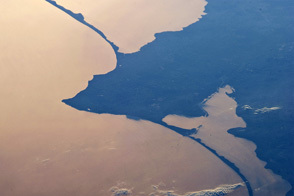 Editor’s Note: Today’s caption is the answer to Earth Observatory’s August 2015 puzzler. Cyanobacteria are an ancient type of marine bacteria that, like other phytoplankton, capture and store solar energy through photosynthesis. Some are toxic to humans and animals. 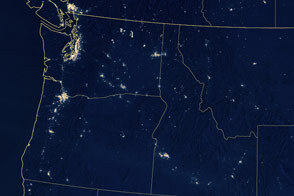 Moreover, large blooms can cause an oxygen-depleted dead zone where other organisms cannot survive. 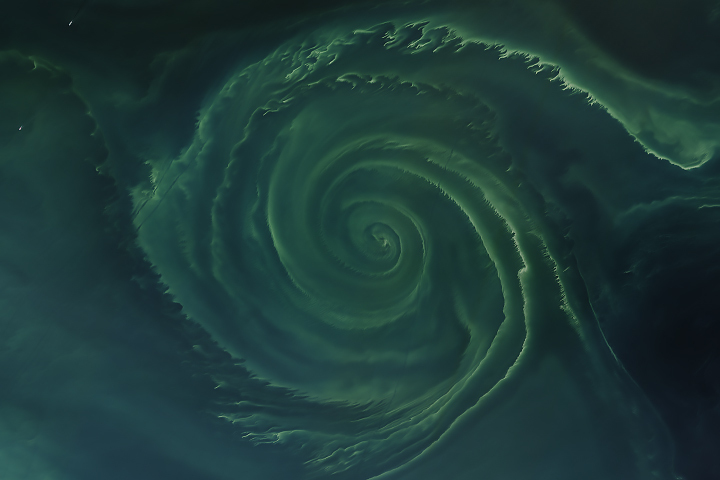 On August 11, 2015, the Operational Land Imager (OLI) on Landsat 8 captured this false-color view of what appears to be a large bloom of cyanobacteria swirling in the Baltic Sea. 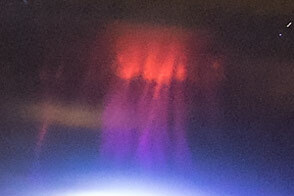 The image was composed from bands 4 (640-670 nanometers), 3 (530-590 nanometers), and 2 (450-510 nanometers) for the red, green, and blue components of the image, respectively. Band 8 (500-680 nanometers) was used to sharpen the image. Satellite images alone cannot say definitively that this bloom contains cyanobacteria—analysis of ocean water samples would be required to confirm it. 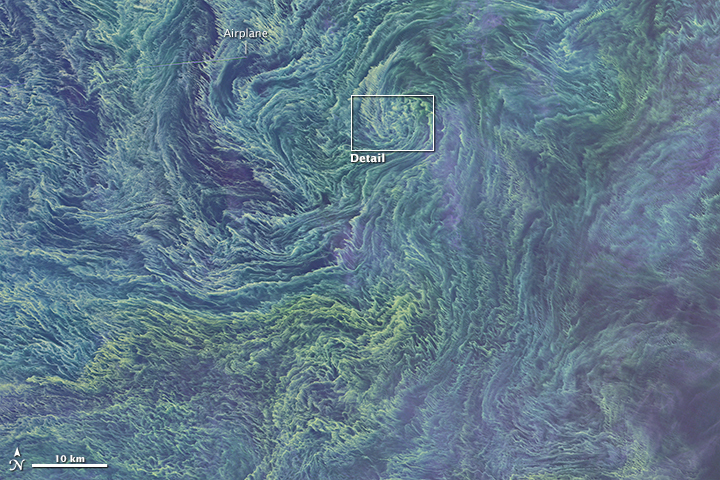 Yet, “major cyanobacteria blooms have appeared nearly every summer for a while now, and they always look like this in the satellite data,” explained NASA oceanographer Norman Kuring. Blooms like this flourish in the Baltic Sea during summertime, when there is ample sunlight and high levels of nutrients. Voss’s vessel was not the only ship in the sea. Tracks of several other ships show up as dark lines where they have cut through the bloom in the large image. One of these ships is especially apparent in the top image, which shows a close-up view of part of the bloom. This vessel could be any number of ships that frequent the Baltic Sea. Cruise ships, for example, are often in the area, and they have been reported to play a role in contributing excess nutrients, through the dumping of sewage, that lead to the large, dense blooms. Agricultural and industrial run-off from European countries bordering the Baltic Sea (see map, below) also contributes excess nutrients. According to one report, nutrient loads to the Baltic have been decreasing since 1980 and coastal areas have seen improvement. Concentrations in the open sea, however, have not changed much. NASA images by Norman Kuring, NASA’s Ocean Color Web. 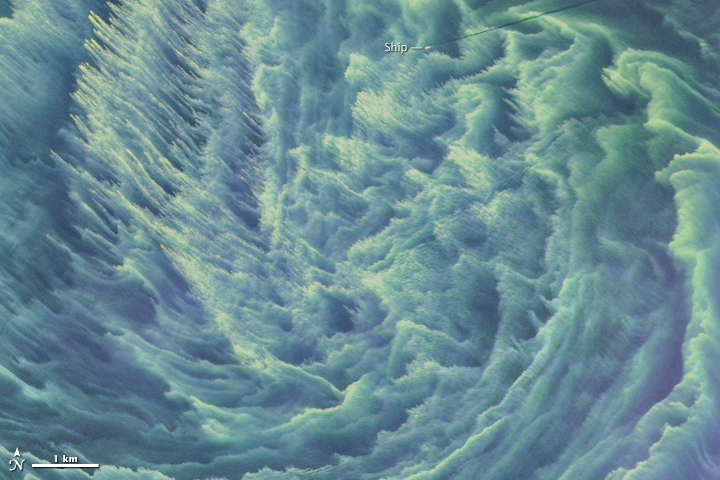 NASA Earth Observatory map by Joshua Stevens, based on data from Natural Earth. Caption by Kathryn Hansen. An annual summertime bloom of cyanobacteria flourishes in the Baltic Sea. Arctic Newswire (2015, May 16) Most luxury cruise liners still dumping sewage in Baltic Sea. Accessed August 21, 2015. 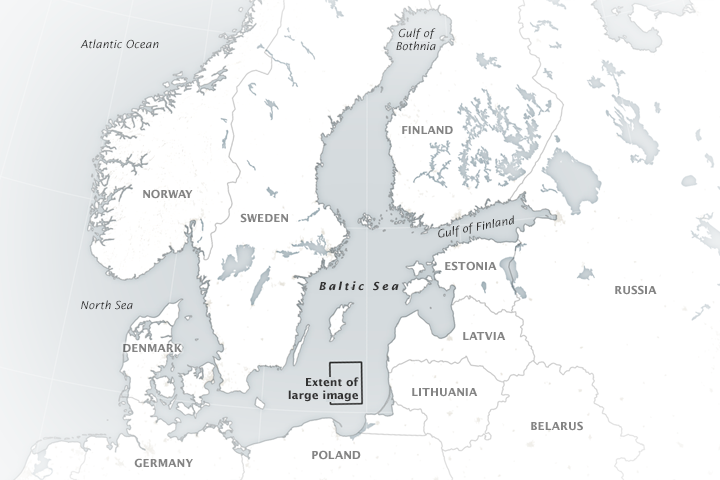 Elmgren, R. et al, (2015, June) Baltic Sea management: Successes and failures. AMBIO 44 (3) 335-344. 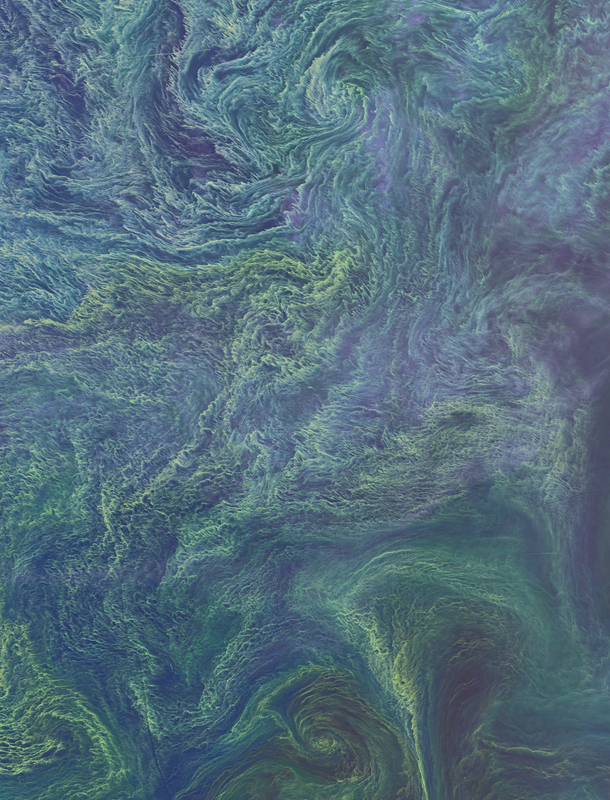 Helcom (2014) Cyanobacterial Blooms in the Baltic Sea in 2014. Accessed August 21, 2015.